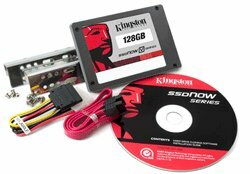 Kingston introduced the new SSDNow V "Value" series of solid state disk with support for the TRIM command. Performance depends on the model, the 128GB version is the fastest one with read speeds of up to 200MB/s and write speeds of up to 160MB/s. The disks are sold as stand-alone, or in special notebook or desktop bundles. The stand-alone 30GB, 64GB and 128GB SSDs will be available for around $110, $208 and $362, respectively. Full specifications can be found over here. Kingston Digital, Inc., the Flash memory affiliate of Kingston Technology Company, Inc., the independent world leader in memory products, today announced it will ship its second generation SSDNow V Series solid-state drive (SSD) on February 15. Targeted for mainstream consumers and small and medium businesses, the new Kingston® SSDNow V Series offers higher performance than its predecessor and supports Windows® 7 TRIM functionality while maintaining pricing. Capacities are 30GB, 64GB and 128GB and the drive comes as a standalone unit or with a bundled solution for desktop or notebook systems. "Kingston has really increased the performance on the new second generation SSDNow V Series drive without raising the price. A first-generation SSDNow V Series 64GB bundle upgrade kit can be found for about $150 (U.S.) at retailers and e-tailers so maintaining pricing will be huge for our customers," said Ariel Perez, SSD business manager, Kingston. "By bundling together all of the software, hardware and step-by-step instructions with the drive, we make it easy for everyday users to upgrade with an SSD. The addition of TRIM support is a key benefit because it enables the SSD to maintain optimal performance throughout its lifespan." Kingston's SSDNow V Series upgrade bundles are the simplest, most efficient upgrade path to inject new life and performance into an existing desktop or notebook PC. There is no need to reload the operating system or do anything that would alter critical data files. The included cloning software makes it simple to move the contents of the existing hard-disk drive (HDD) to the SSD. The Kingston SSDNow V Series and bundle are backed by a three-year warranty, 24/7 tech support and legendary Kingston reliability.